Information, standards and guidance on work in the historic environment of Somerset. Revised 2017 edition (23/11/2017). Minor amendments. (2) Digital archiving and deposition and storage charges. (3) Revised planning charges (17/1/2018). (4) Revised implentation date for planning charges. (5) Clarification of building record archiving (5/3/2018). (6) Clarification of deposition charges (6/4/2018). Information on the methodology used to prepare the HLC layer in the HER. Detailed archaeological assessments of the towns of Somerset. Aerial photographic survey of the Quantock Hills AONB (1989). Aerial photographic survey of the Mendip Hills AONB (1992). Survey and condition (2001) report on the Second World War airfield. Papers to mark 150 years of the Somerset Archaeological and Natural History Society. 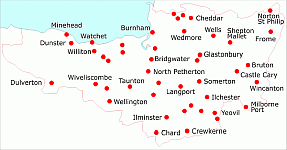 The South West Heritage Trust provides heritage services for Somerset County Council.